All Web addresses mentioned were functional as of 4-24-15. This week, we feature sounds that are especially mysterious, because special equipment and processing were needed for humans to hear them at all! Have a listen for about 15 seconds and see if you can guess what kind of animal made the sounds. And here’s a hint: If you’re a night-flying insect, high-frequency waves might cause the last echo of you. If you guessed bats, you’re right! Special techniques can make audible to humans the ultrasonic waves that bats emit and receive to navigate and detect food—a process called echolocation but sometimes referred to as sonar. Alex Silvis, a researcher with the Virginia Cooperative Fish and Wildlife Research Unit, recorded and processed the sounds you heard, from the Hoary Bat, Red Bat, and Northern Long-eared Bat. Those are three of the 17 bat species known to occur in Virginia, out of over 1000 species worldwide. While some bat species eat fruits, nectar, other vertebrate animals, or blood in the case of vampire bats, all Virginia species feed on night-flying insects, a special ecological role made possible by bat echolocation and flying abilities. And many bats seeking insects find them near water. Many aquatic insects—such as mayflies, blackflies, and stoneflies—develop from underwater juveniles to winged adults, and bats forage near water to prey on the emerging adults. Water is also an important aspect of the caves that many bats use for resting, reproduction, or winter hibernation. Many caves are formed by groundwater, and caves offer high humidity to reduce bat dehydration during hibernation. Unfortunately, cave humidity’s also good for White-nose Syndrome, a fungal disease that’s killed millions of bats in eastern North America since 2006. Besides that disease, other threats to certain bat species in Virginia or elsewhere include habitat loss or contamination, disturbance during hibernation, human hunting for food, and humans’ perceptions—sometimes exaggerated, or even mythical—of bats as disease-carriers, crop destroyers, or vampires. NOT exaggerated or mythical, though, are bats’ importance to humans as insect eaters and as plant pollinators, and water’s importance to bats. As the Cooperative Research Unit’s leader Mark Ford put it, “Any given bat on any given night probably foraged over or near water.” So we close with some bat and water-insect music: a short excerpt of “Little Brown Bats Eating Mosquitoes,” by Timothy Seaman of Williamsburg. Thanks to Mr. Seaman for permission to use this music, and thanks to Alex Silvis for the bat sounds. The recordings of bat echolocation sounds were provided in March 2015 by Alexander Silvis, a postdoctoral research associate with the Virginia Cooperative Fish and Wildlife Research Unit and the Virginia Tech Department of Fish and Wildlife Conservation. Thanks to Mr. Silvis for permission to use the recordings, and thanks to him and to Dr. Mark Ford, leader of the Cooperative Research Unit at Virginia Tech, their help with this episode. More information about the Cooperative Research Unit is available online at http://www.coopunits.org/Virginia/index.html. “Little Brown Bats Eating Mosquitoes,” from the 2004 CD “Virginia Wildlife,” is copyright by Timothy Seaman and Pine Wind Music, used with permission; this music was previously used as the feature of Virginia Water Radio Episode 78, 9-5-11. Mr. Seaman’s Web site is http://www.timothyseaman.com/. The “Virginia Wildlife” CD was a collaboration between Mr. Seaman and the Virginia Department of Game and Inland Fisheries to celebrate Virginia’s natural resources and support non-game wildlife programs. “Little Brown Bats Eating Mosquitoes” was composed in honor of Virginia’s Non-Game Wildlife Tax Check-off; information about Virginia’s program for contributions to organizations and programs through tax check-offs is available online at http://www.tax.virginia.gov/content/voluntary-contributions. The two photos above, taken in caves in West Virginia, are of Virginia Big-eared Bats, Corynorhinus townsendii virginianus, designated in 2005 as Virginia’s state bat. This bat is listed on both the federal and state endangered species lists. For more on this species, see the Virginia Department of Conservation/Natural Heritage Division Web site at http://www.dcr.virginia.gov/natural_heritage/karst_stbat.shtml. Photos by Craig Stihler (upper photo) and Jeff Hajenga (lower photo), made available for public use by the U.S. Fish and Wildlife Service’s National Digital Library, online at http://digitalmedia.fws.gov/cdm/search/collection/natdiglib/searchterm/Bats/order/nosort. Sign in Virginia Tech's Liberal Arts Building, April 23, 2015. Photo courtesy of Eli Archer. According to VDGIF’s “Bats/Bat Facts” Web page, online at http://www.dgif.virginia.gov/wildlife/bats/, Virginia’s bat species “are divided into two categories: cave bats and tree bats. Cave bats hibernate in caves, while tree bats hibernate in leaf clusters, under decaying logs, in hollow trees, or sometimes in abandoned mines or old buildings.” Cave-hibernating species may use similar areas, such as mines or wells. Different bat species also use a variety of habitats for roosting (daytime resting), including caves, trees, buildings, other structures, and mines. Decades of Bat Observations Reveal Uptick in New Causes of Mass Mortality, U.S. Geological Survey News Release, 1/19/16. Bats make other sounds, or “vocalizations,” beside the ultrasonic (or very high frequency) sounds used in echolocation of prey or obstacles. Bat communication includes vocalizations between females and young and various calls by males used in mating courtship and in defending territory. The observance for 2015 runs April 19-25, and bat conservation is the 2015 theme. The Virginia Department of Conservation and Recreation’s April 8, 2015, news release about Cave Week 2015 is online at this link. More information about the week, bat conservation, and bats connections to Virginia caves and other karst features is available from the Virginia Cave Board, online at http://www.vacaveweek.com/. John D. Altringham, Bats—From Evolution to Conservation (Second Edition), Oxford University Pres, Oxford, U.K., 2011. W. Mark Ford and Hannah Hamilton, “Identifying Bats By Sound; Following White-Nose Syndrome, Acoustic Method Best for Sampling Bats,” U.S. Geological Survey News Release, 2/12/14, online at http://www.usgs.gov/newsroom/article_pf.asp?ID=3801. Michael J. Harve, J. Scott Altenbach, and Troy L. Best, Bats of the United States, Arkansas Game and Fish Commission/U.S. Fish and Wildlife Service, Asheville, N.C., 1999. Phil Richardson, Bats, Firefly Books, Buffalo, N.Y., 2011. U.S. 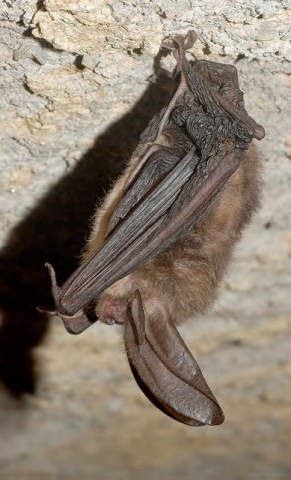 Fish and Wildlife Service/Midwest Region, “Glossary of Acoustic Bat Survey Terms,” online at http://www.fws.gov/midwest/endangered/mammals/inba/surveys/inbasurveyglossary.html. U.S. Fish and Wildlife Service’s White-nose Syndrome Web site, online at https://www.whitenosesyndrome.org/. 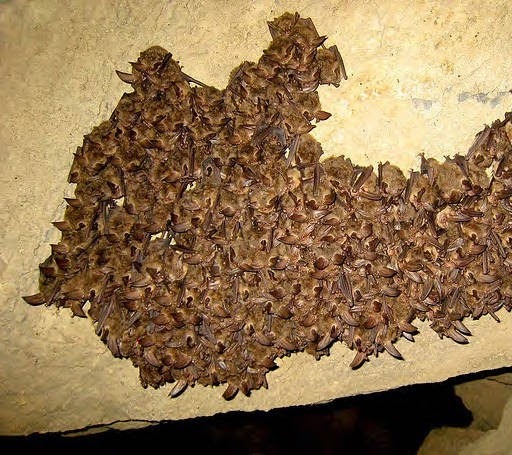 Virginia Department of Conservation and Recreation/Natural Heritage Division, “Bats of Virginia,” online at http://www.dcr.virginia.gov/natural_heritage/karst_bats.shtml. Virginia Department of Game and Inland Fisheries, “Little Brown Bat,” online at http://www.dgif.virginia.gov/wildlife/information/?s=050020. Virginia Department of Game and Inland Fisheries, “Bats,” online at http://www.dgif.virginia.gov/wildlife/bats/. Bat Conservation International, online at http://www.batcon.org/. National Speleological Society, online at http://caves.org/. U.S. Geological Survey/Western Ecological Research Center, “Bat Vocalizations—Search Phase Call,” online at http://www.werc.usgs.gov/OLDsitedata/bats/searchphasecall.html. These are recordings of bat echolocation sounds for which the frequency has been lowered to make them audible to humans (except for one species, where the sounds are already audible). Virginia Department of Conservation and Recreation/Natural Heritage Division, “Cave and Karst Protection,” online at http://www.dcr.virginia.gov/natural_heritage/karsthome.shtml.